Diabetes is a costly and prevalent health issue in our society. Due to extensive research we are all reasonably well educated about the importance of diet and exercise to the diabetic and their quality of lifestyle. Exercise is similar to diet in that some generalisations may apply to the diabetic population as a whole. Medical research has enabled General Practitioners and Health Professionals to offer specialised dietary information to suit the various needs of individual diabetics. Though exercise is recognised as an equally important health maintenance factor it is often assumed that any exercise is better than no exercise. This generalised approach is fraught with danger. For example, the stress of sudden, unfamiliar exercise may trigger dangerous complications in the older diabetic. Organisations such as the International Diabetes Institute recognise the problems associated with recommending general aerobic activities to older type 2 diabetics. With the availability of increasing research data, it is becoming clear that different groups within the diabetic population also have different exercise requirements. 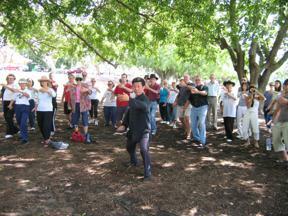 The Australian Academy of Tai Chi & Qigong has created an easy to learn Diabetes Exercise Program. This Specialised Program has been designed to teach skills that can be used as a platform for a total exercise plan. It is adaptable to, and suitable for, all ages. The unique combination of Chinese Health Art exercises, dynamic relaxation techniques and education makes this program invaluable for anyone who is serious about using exercise as a diabetes management tool. Qualified and specialised instructors teach each client how to combine the elements of the program to enhance blood flow and help stabilise blood sugar levels. Our program is designed to train each system within the body to operate under the least amount of stress during exercise. This significantly reduces the demand for energy, which decreases the risk of suddenly releasing sugars, which helps to maintain stable blood sugar levels. Clients who complete this Specialised Program will gain principles and skills that can be applied to other activities, making them integral components of the individual?s approach to exercise.